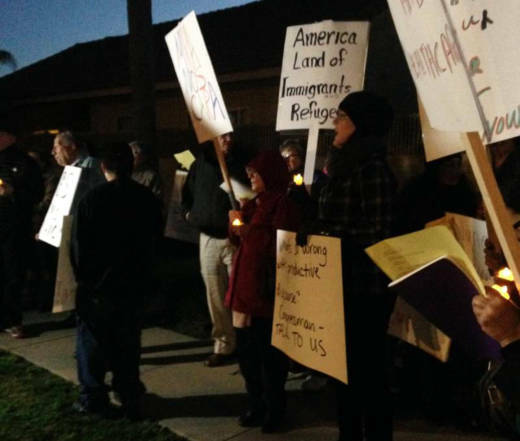 Tulare isn't known much for demonstrations, but last Thursday the small Central Valley farming town became the latest stop in a campaign to call out members of Congress who were skipping town hall meetings during the congressional recess. 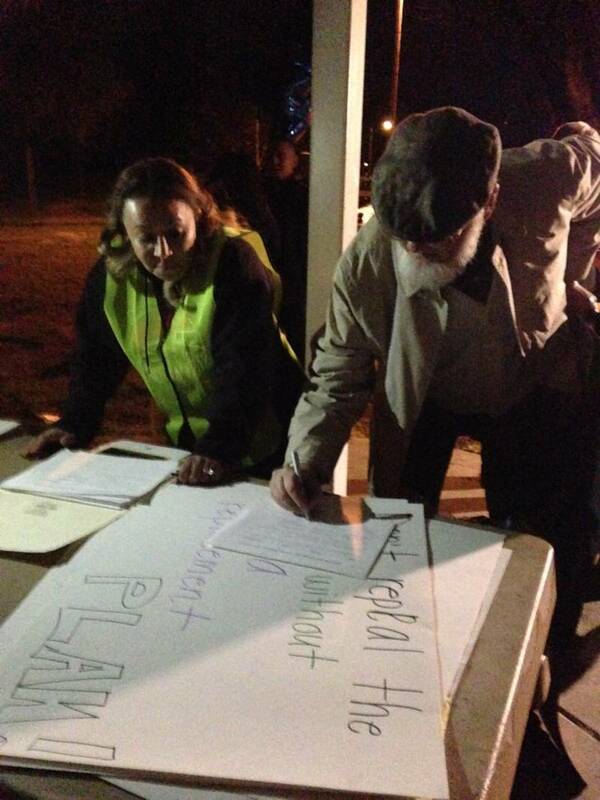 About 100 demonstrators gathered in a city park at dusk. With signs reading “No Wall” and “Yes to the ACA," marchers chanted “Keep our health care! No repeal!” as they were escorted across a busy street by police officers. They walked back and forth on the sidewalk outside of the gated neighborhood where Rep. Devin Nunes owns a home. Carroll said he’s met all his former representatives at town hall meetings or other public events. He said one even came to talk to his eighth-grade class. “Congressmen are supposed to get out and meet their constituents,” he said. At least one marcher, Roberto Bustos, had some experience in acts of resistance. “I’m one of the original strikers of the 1965 Delano Grape Strike,” he said. Bustos also helped lead the historic United Farm Workers march from Delano to Sacramento. He said he joined the Tulare vigil to continue the fight for immigrant rights. They called out David Valadao (CA-21), Rep. Jeff Denham (CA-10) Rep. Kevin McCarthy (CA-23), Rep. Dana Rohrabacher (CA-48), Rep. Ed Royce (CA-39) and Rep. Steve Knight (CA-25) for not scheduling town hall meetings. Connor said last week was a good one to hold a town hall event because most representatives, including Nunes, were back in their districts. "We knew that he was home. He had an event in Bakersfield just two nights ago," she said last week. Nunes, who is a member of President Donald Trump's transition team and the chairman of the House Intelligence Committee, was a keynote speaker at a fundraiser for the GOP.